What’s all this If This Then That business? App talk is the natural by-product of filling an office with tech savvy, attractive, hilarious individuals. One of my favourites to have cropped up in conversation recently is If This Then That (or IFTTTT). The idea behind IFTTTT is simple – Put the internet to work for you. The app creates “recipes” that connects two apps together based on defined “triggers”. Essentially, you’re getting apps to work together in ways they’re not technically designed for. There are some amazingly useful ones (turning your phone off silent when it’s misplaced), some cheeky ones (Send you a notification when your wife posts to Instagram) and some downright silly ones (Every Friday at 8am, post a link to Rebecca Black’s “Friday” on Twitter? No thank you). Post your Instagram pics as native Twitter pics: This recipe shows your Instagram pics as full images rather than a link to your Instagram. More visibility on your content means you’re more likely to have it shared! Syndicate posts across all channels: You write some fantastic content on your website, but how can you let you everyone know? Simple really, just use this recipe that will create a link and post on your behalf to your Facebook or Twitter feed. Become the Master of Flexible Content: We’re skilled at many things here at Threesides, but unfortunately we can’t predict the weather. With a recipe that can tweet on your behalf when the weather hits a certain temp, you can be posting timely and relevant content without needing to hit a button. Entice your followers to come in for a steaming hot coffee when the Canberra chill sets in, or perhaps encourage them to have a game of bowls when the suns out. #winning: There’s no denying it, hashtags are here to stay, and there’s plenty of ways your business can use them to your advantage. Say you’re organising a competition and want to keep track of entries that feature a hashtag of your creation. 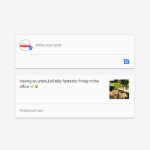 This recipe will automatically update your Google Spreadsheet with entries that contain your hashtag, making it far easier to search and find a winning tweet or Instagram. Keep tabs on your competitor’s content: Want to keep track of new deals or specials that your competitors are promoting? This recipe sends you a text message when your competitors create content (sourced from their RSS feed) that features key words of your choosing. Save your photos to one spot: We make no secret of how much we like Dropbox for keeping our servers running healthily, so why not put a recipe to work that will save your photos in one handy spot? Take a break: Whether it’s getting a Dilbert comic strip delivered to your inbox daily or having Netflix send you an email when they add new titles, use IFTTTT to help manage your down time as well. IFTTTT is available on Android and iOS products. Do you use IFTTTT? Tell us what your favourite recipes are down below or comment on our Facebook and Twitter.